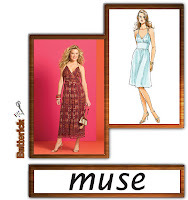 Pattern Description:Butterick 4977 Halter Dress–Lined, halter dress, fitted across bust, has braided ties around neck, gathered skirt and upper section with purchased bra cups. View B: above ankle length with front slit opening, invisible zipper closing. Pattern Sizing:6-12. I made a size 10. This was bit small for me. I should have made a 12, because the bodice doesn’t cover quite to my liking, and it’s a bit snug in the waist. Were the instructions easy to follow? I would say that the instructions were very thorough. 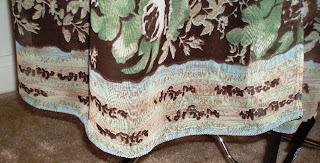 The only blip was that the instructions neglect to tell you to slip-stitch the midriff lining to the skirt lining. 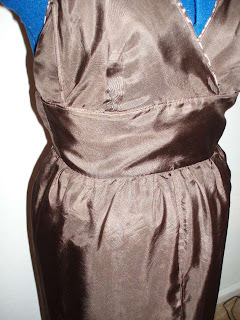 When you add the midriff, you sew the fashion fabric and lining to the bodice. Only the outer fabric’s lower edge is basted to the outer skirt, while the midriff lining hangs free and is pressed under (before hand). 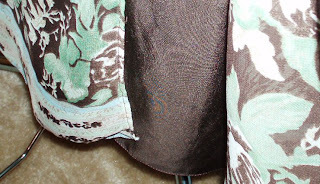 Then the lining is sewn to the outer skirt, and the midriff lining is slip-stitched to the skirt lining to create a smooth finished look on the inside. What did you particularly like or dislike about the pattern? I don’t usually like halter dresses, but I thought this pattern was cute, and I found the best fabric to show it off. At first I didn’t like the slit in the front because I thought it was unnecessary, especially for the fabric I chose. I thought the square pattern would be displayed in the very front, which posed some positioning challenges. As is turned out, once I cut out the skirt, I realized that the seams are front and back, not on the sides. This positioned the squares on the sides, which worked out fine. I didn’t have to worry about messing them up with the slit. I like the look of the braided straps. They were a pain to make, as I cut each strip separately, but they came out well. Fabric Used: Fashion fabric, polyester chiffon; lining, China silk. 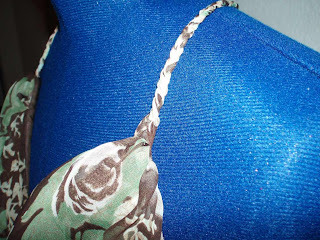 Pattern alterations or any design changes you made:N/A. Would you sew it again? Would you recommend it to others? It’s not likely I will sew this again. This is a very distinctive dress, and I’m not much for halters. Conclusion: Let’s just say, I won’t be wearing this dress to the church picnic, but I think it would make a good date dress. I think that fits you to a tee. Fabulous placement of the print fabric, too. Wow, you made a beautiful dress. I plan to do mine. Love the linning and the fabric colors. Congratulations. Girl you good in that dress!! Great job on the lining! You’ve been tagged please see my blog! Gorgeous dress and it looks great on you! this is beautiful, it fits you perfectly!